Jeff Johnson joined the lawyers at Ahlstrom Wright in 2014 as a student at law, and was called to the Bar in both Alberta and the Northwest Territories in 2015. Enjoying a variety of practice areas, he focuses on practical and satisfying solutions for clients. Jeff puts effort into understanding his clients’ underlying priorities and motivations when they become involved in legal matters. He capitalizes on his diverse background to foster effective communication with his clients and with all other parties involved. Jeff brings a diverse background to his practice at law. He has been a professional musician in the Edmonton community for more than 20 years, and was a sessional instructor in the MacEwan University music department for 15 years. 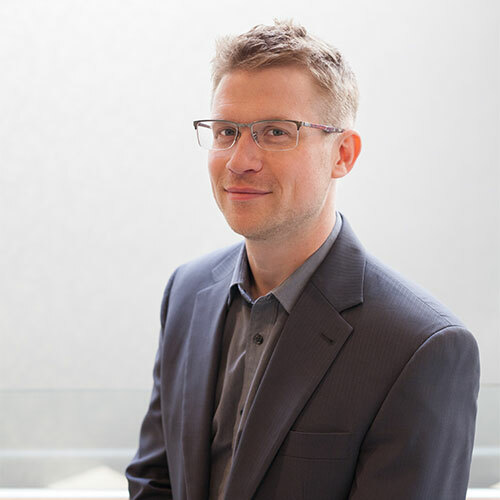 After graduating in 2009 from the University of Alberta with his Law degree, Jeff worked with a small local hospitality business for three years before grappling with environmental and land regulations with a large electric utility company for another two years.